Superb 2 Bed Caravan, New Romney, Dymchurch. Family-friendly. RECENTLY UPGRADED !!! (Apr/19) Get away from it all with a relaxing break. Based on a Holiday Park in New Romney. Friendly quiet park with swimming pool, restaurant, clubhouse, pub, mini mart, launderette, children play area, backing on to New Romney conservation area. Short walk to St. Mary bay, beautiful sandy beach. Port Lympne Zoo with safari style zoo. The joy of the world's smallest railway in Dymchurch and historic town of Canterbury is not too far.Camber Sand is a 15 minute drive along with the ancient town of Winchelsea. Bus route outside caravan park which takes you to Ashford, Canterbury, Folkestone, Dover and Rye. Easy access to Channel Tunnel if you fancy that day trip to France. Bed linen and towels are provided along with tea, coffee, sugar. 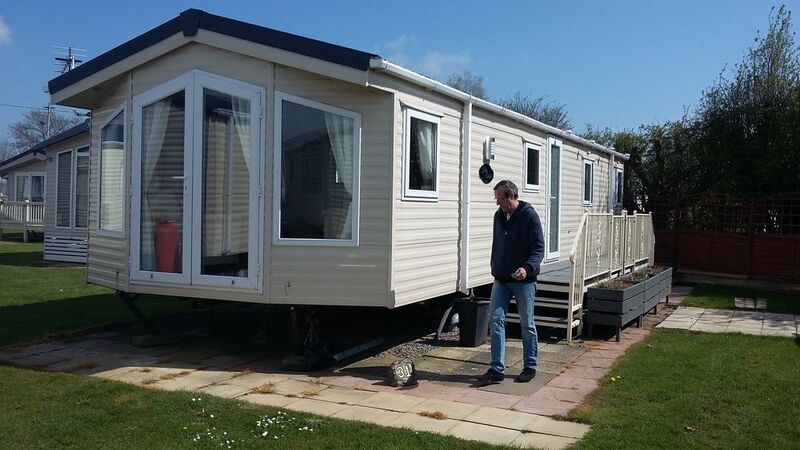 This friendly caravan site has majority owned private caravans. We are friendly couple who live close to the caravan park. We have enjoyed many caravanning holidays over the years, we appreciate what families are looking for on their break. We provide all basic things you need. Which include pillows, bed linen, duvets,towels-tea towels, tea coffee, sugar, soap, shampoo, shower gel and toilet rolls. All you need to remember is make sure you bring your children and pet if you have. All bed sheets, duvets and pillows and cases are provided. 15 metres away from the caravan. Paid WiFi at the caravan. Free at the club house. 32 inch flat screen TV, coffee table. Tea, coffee, sugar, salt, pepper, vinegar, ketchup, brown sauce, mayonnaise. Free standing dining table. Seats 4-6. Action water sports, Lydd. 4 miles away. Bike for hire shop in the village of New Romney. Within 2 miles of Holiday Park. Ideal opportunity to enjoy a caravanning holiday close to wonderful beaches and away from the stress of the city life. This is the second time I’ve stayed here. The caravan is lovely, cosy and clean. Nice area, good pitch on the site, look forward to returning. Superb 2 Bedroom Caravan, I Think Not !!! We left earlier, on Monday, instead of staying till Tuesday, as found the stay was sadly not up to standard on certain aspects. 1: The caravan has two entry doors, as the main (left hand side one) door swells in the warm weather/heat and catches the handrail of the steps, making it impossible to open the door from the inside. hand side, as the door would not open when swelled from heat, Luckily the front door by bedroom was fine. 2: kitchen area - The small baking tray was unusable and should be thrown away and another tray was greasy on the back unwashed. 3: In the sugar jar, which was unclean, with sugar stuck to the inside we noticed that there were only 2 sugar cubes, but we had brought our own sweeteners that we use, for future guests, when it's 2 sugar cubes, better not to supply any, rather than such a small amount. The scouring pad was dirty with black marks, so should be replaced when new guests arrive. We bought dinner to cook and put oven chips in the oven on the highest temperature, In an hour, they were still white, so we gave up and threw them away. The oven needs to be checked that it works properly, as the flame was on. 4: Bathroom - The toilet flushing was guesswork. Mostly it was gathering water and would flush properly on approx 4 – 5 flush. The small hand soap looked clean, but the bath soap, looked old and used with cracks in it. Best not to supply, unless in wrapper. Bottled products can be acceptable used, but not items like soap bars. The worst offender was the toilet brush. I went to use it and had to stop myself from throwing up, so filthy, months of germs! A suggestion would be to go to purchase a quantity of 99p value toilet brushes to replace each time a new guest stays, if you don't fancy cleaning the one previously used. The shower cable clip tidy that the hose fits into is a DIY job as it has a jagged sharp point on and I just avoided cutting myself on it, and being on blood thinning medication, could have been blood gushing out quite a lot. 5: The mattress is too small for the bed base, where one can catch a leg on the hardboard underneath, (that is sticking out on the sides). The sitting room was absolutely lovely. The owners should have a check list of things like clean toilet brush, working toilet, functioning cooker oven and standard list to go by, possibly staying over themselves sometimes, to see if they can spot any problems. We packed up and left a night early.